You want to buy a cheap plane ticket from Cape Town to Johannesburg. Here's a history of surveys of which airline's been cheapest from Cape Town to Johannesburg. The cheapest flight we found to Johannesburg for the Standard Bank Joy of Jazz festival was with Mango to Lanseria. Mango proved to have the cheapest flight prices from Cape Town to Johannesburg for the Comedy Central Colourblind show. The cheapest flight we found for travel from Cape Town to Johannesburg for the Mother's Day weekend was offered by Kulula to Lanseria. Take your Valentine on a trip to Johannesburg with Kulula who offered the cheapest travel rates on the Cape Town to Johannesburg route. In this first survey of travel prices in 2014, Mango to Lanseria offered the cheapest flight from Cape Town to Johannesburg. The cheapest flight we found from Cape Town was Mango to Lanseria Airport for the Transoranje Christmas Market. Mango to Lanseria Airport was the cheapest flight option we found from Cape Town to Johannesburg for Trevor Noah's comedy show. Mango Airline offered the cheapest one way flight from Cape Town to Johannesburg for the Gauteng Getaway Show. Mango offered the cheapest flights from Cape Town to Johannesburg for the Johannesburg Pet Expo. Passengers who opt to fly to Lanseria Airport from Cape Town will enjoy the cheapest flights on the Cape Town to Johannesburg route. Mango to Lanseria Airport was the cheapest option when we checked the prices of flights from Cape Town to Johannesburg for the Freedom Day weekend. Ramfest festival-goers should check Mango's flight prices, as they offered the cheapest flights when we compared the prices of flights from Cape Town to Johannesburg. Mango offered the cheapest flights in this week's survey of flights to Johannesburg. With Mango's sale introduced on this route, flights from Cape Town to OR Tambo Airport in Johannesburg were the cheapest option. Mango to Lanseria is the best option for flights to Johannesburg for the Whisky Live Festival. This week, the airfares to Lanseria Airport were more reasonable than the airfares to OR Tambo on most airlines. Mango offered the cheapest flights to both OR Tambo and Lanseria Airports. Mango Airline is offering the cheapest one-way flight to OR Tambo as well as to Lanseria Airport. Kulula to Lanseria has the cheapest one-way flight on this route. If you are in JHB over this weekend, make sure to visit the 105th annual Schul-Basar hosted by the Deutsche Internationale Schule. Velvet Sky airline has had all flights suspended, making Mango Airline the cheapest flight from CPT to JHB Lanseria. Velvet Sky is once again in the lead with the cheapest flight from CPT to JHB. Their prices have increased slightly for March - must be that school holidays are around the corner. In our first survey of 2012, Velvet Sky are easily the cheapest from CPT to JHB. BA are the cheapest since 30 July 2010. Velvet Sky is even cheaper than taking a Greyhound bus (R680). Since Mango joined Kulula there, we're witnessing massive competition on the Cape Town to Lanseria flight route. 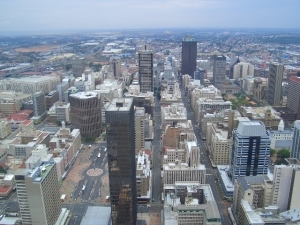 The cheapest flights to Johannesburg are regularly to Lanseria Airport. Note the large differences in flight prices. We have to go all the way back to the 8th December 2007 to find a higher 1time price. Mango Airline's price is cheaper than Greyhound and Intercape. Once again Velvet Sky are cheapest, and this time they're under R500. For the first time Velvet Sky Airline are included in our survey, and they are cheapest. June school holidays and Mango Airlines is once again cheapest from CPT to JNB. For the 3rd survey in a row, Mango are cheapest, with 1time's price being the most expensive since our 8 Dec 2007 survey. Mango has returned to being cheapest, but Kulula is only R6 more from Cape Town to Johannesburg. Mango Airlines remains sold out, with 1time being cheapest (although SAA at R6 more expensive is better value, given that it's a full service carrier). With flight prices decreasing and overland prices increasing, flight prices are now only 2.4 times as expensive as a Shosholoza Meyl train trip. The price of flights has gone up but the price of a train trip has gone up proportionately more. Shosholoza Meyl is back and the ratio of flights has therefore risen up to a very high 4 times the price of trains. With a power failure meaning no Shosholoza Meyl train quotes, the price of available buses & trains has risen relative to flight prices. The flight:bus price index measures how many times more expensive the cheapest flight is relative to the cheapest bus/train. The flight price inflation index compares the cost of the cheapest flight in a survey to what it was a year previously. This may be distorted by particular events on the date (e.g. if it was the Friday before school holidays, flight prices would be a lot higher). British Airways is offering the cheapest Cape Town to Johannesburg business class flights.